So, by now there is a good chance that you’ve the LEGO Movie 2 and loved it as much as I did. Despite not quite outdoing the original, it came very close and provides just as much awesomeness. I have, however, already reviewed the movie and following that great cinema adventure, it’s back to the LEGO tie-in sets. 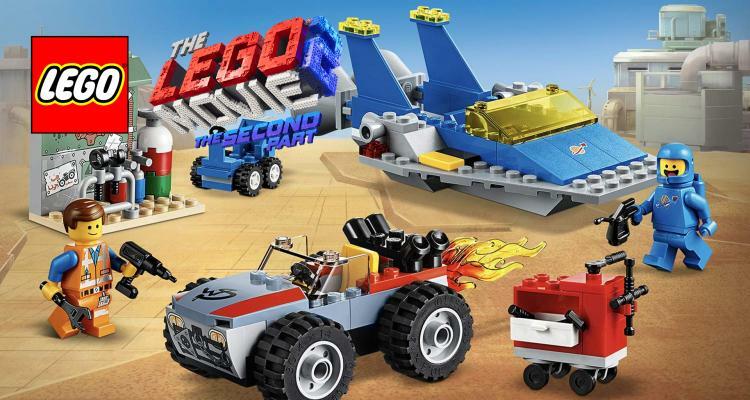 With so many to choose from, the LEGO Movie 2 certainly offers something for every LEGO fan. 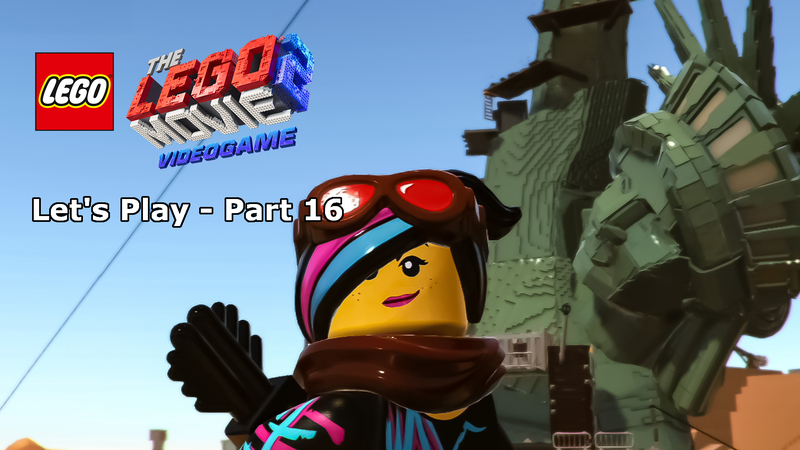 Whether you’re a fan of the core characters, love your DUPLO, want an adventure with apocalyptic Batman, or are happiest with LEGO Friends, the diversity on offer out-ways any movie tie-in theme that has come before. It’s because of this that I wanted to focus my next review on this, Emmet and Benny’s ‘Build and Fix’ Workshop, because, as the BIG 4+ on the box suggests, this is one of the few sets in the range targeted exclusively for younger LEGO fans. For those not familiar, the 4+ range is something that LEGO have been slowly introducing across a good portion of their active themes with the aim of bridging the gap between DUPLO and standard LEGO by creating easier builds for children ready to make that transition. The sets themselves utilise normal LEGO elements, but bypass some of the more tricky and complex building techniques by using purpose-printed pieces. Basically, this is the evolution of LEGO Juniors. The downside is that the price per piece ratio is a little off compared to normal sets, but as a parent of a five-year-old, I believe these new sets to be a genius move by the construction toy company. For those of you reading this that are interested, there are now 4+ Star Wars sets as well. We’re here, however, to discuss Emmet and Benny’s new business venture fixing cars and spaceships for Apocalypseburg, and with a price tag under £20, surely this is a good purchase. 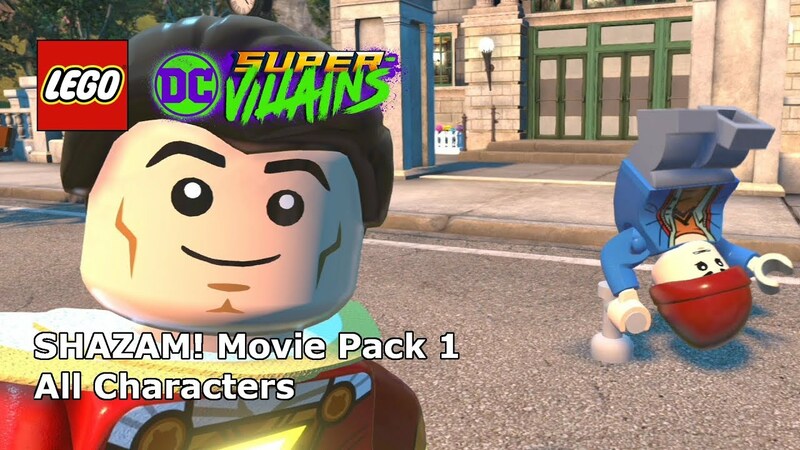 Unsurprisingly, the minifigures included in the set are Emmet and Benny (the name kind of gives it away), and as these two seem to be the most popular minifigures in the series, appearing in multiple sets, there is absolutely no minifigure exclusivity value with buying this set. That said, if you’re looking to pick up these two and you’re not overly bothered about the set they come from then this set will work out slightly cheaper than purchasing the Thricycle and Benny’s Space Squad together. 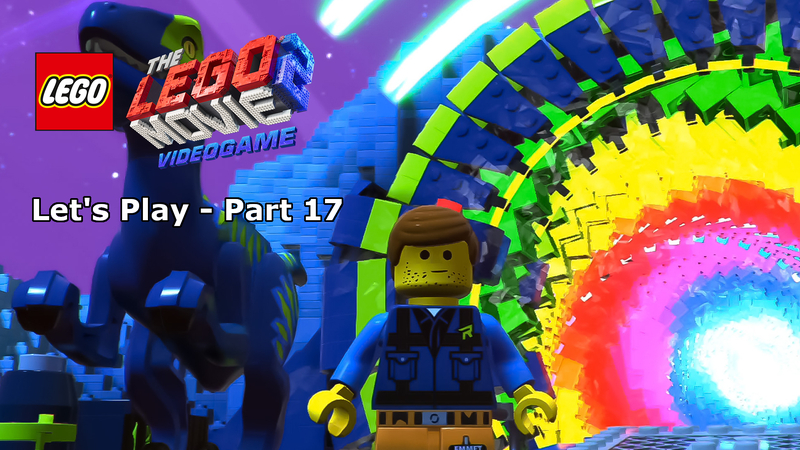 Starting with Emmet and in terms of design, much like other LEGO Movie 2 sets, it’s near on identical to the Emmet found in so many of the 2014 movie tie-in sets. The orange and silver striped construction worker uniform does, however, have a few very, very subtle differences, the kind of that you’d only spot under close inspection. The printing has been designed with deliberate wear and tear, simulating five years of reasonably careful use as the printing clearly looks like it’s been slightly chipped away on the black belt and the silver stripes, both front and back. 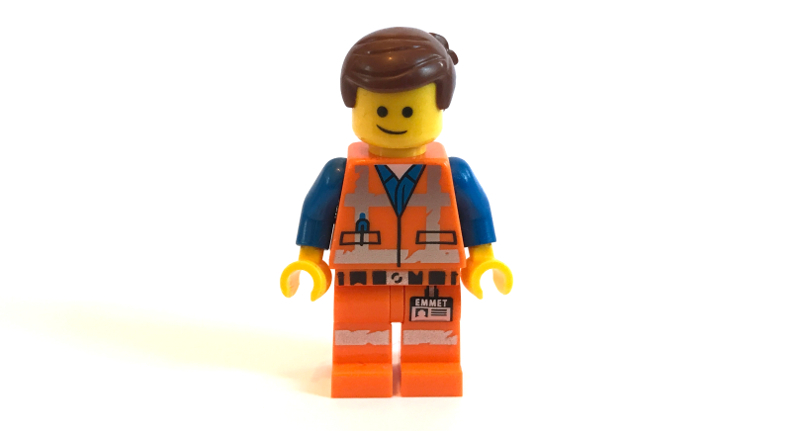 The distinctive aspect with this minifigure is the more simplistic face when compared to other LEGO Movie 2 sets, the mouth is a simple line rather than him being open mouthed and it looks much more like the generic character of the first movie. It’s somewhat fitting given the type of set. Benny is, well, Benny. Much like Emmet, there is very little to distinguish this sets minifigure with a Benny from any other, including the 2014 LEGO Movie sets. 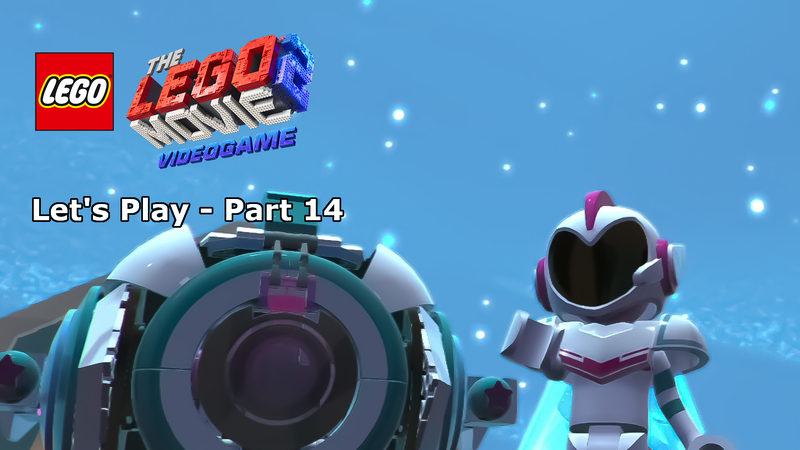 With a faded LEGO Space logo and broken helmet still reminiscent of real-life play back in the 1980’s, you’re not getting anything new from the set, but it’s Benny, so everyone will be happy. 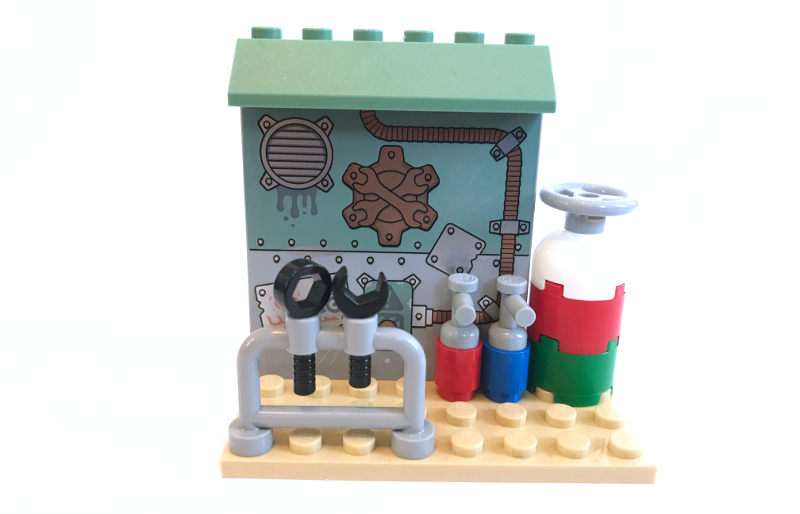 It’s interesting to note, though, that the LEGO Movie Minifigures collection includes a Benny who not only has a robotic hand, but is carrying a toolbox…maybe in reference to this workshop. A fun little build and one that offers a number of possibilities for imaginative play, the tool cabinet on wheels to just brilliant. 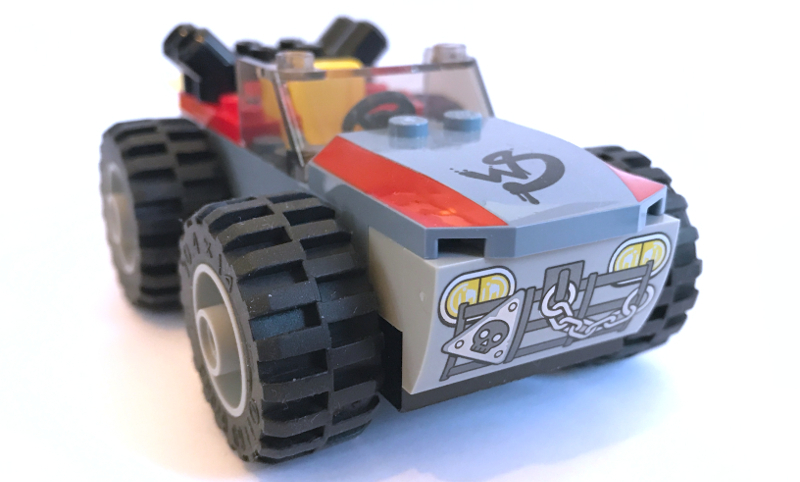 Something just like this cropped up in the LEGO Cars 3 sets a couple of years ago and they make great additional accessories in every theme, even Star Wars with a bit of imagination. In terms of the build, it lives up to what the set is trying to achieve, make awesome looking builds with minimal complexity. 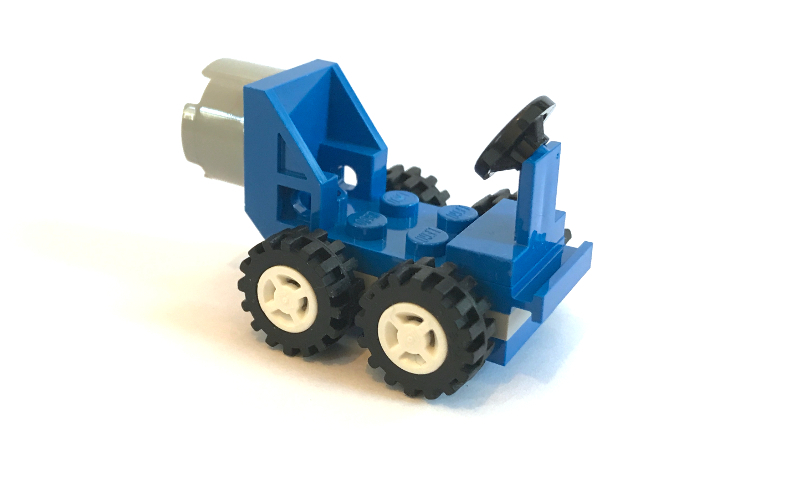 That being said, this is probably the one part of the set that does have fiddly bits to deal with as the small wheels and tools may require a stronger more stable hand than the target audience. The main body of the build is four pieces sat on the grey wheel clip. 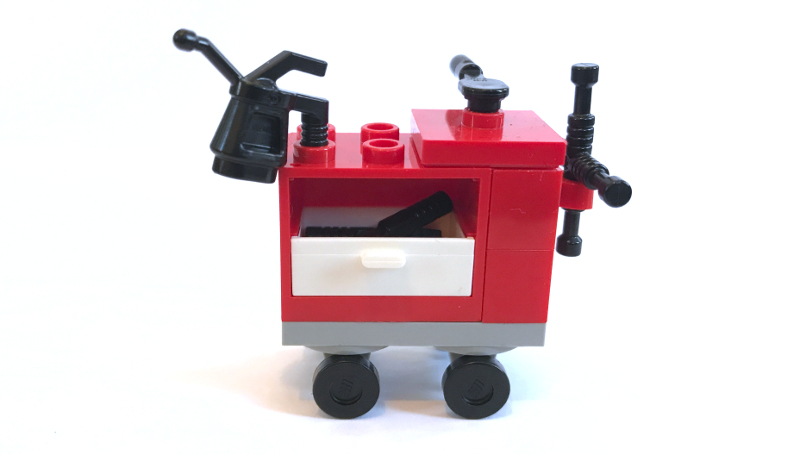 In addition to the red draw frame, which wouldn’t be out of place on the side of a LEGO City fire engine, there are two 2×1 red pieces stacked, one with a clip, and a 2×2 on top mainly to hold the pieces together. Despite it’s flimsy appearance, however, this is a sturdy build and will stay together if dropped. As I mentioned in the introduction to the review, one of the things that really sticks out about the 4+ sets in replacing complexity with purpose-printed pieces, and on this set that is most evident on the workshop scenery build. As you can see from the picture, very few actual pieces go into this creation and yet the completed model will still be seen as a superb achievement by your young LEGO fan. Focusing on the printed piece and you can see that a lot of that detail could have been created using well-used LEGO design methods, the LEGO Batman Movie sets, for instance, had similar detail in the power-plant scenery builds. That, however, isn’t the level of complexity this set is aimed at. Thankfully, above all, these are printed pieces and not LEGO. Returning to the LEGO Cars 3 sets again, Rusty’s garage (10743) had a very similar design, a large printed wall with the same tool holder design. In terms of build, and other than putting the tools into the holder, there isn’t anything here that will challenge the target age range. It’s a 5 build at most, but adds a lot of play value with very little effort. Now, hoever, we get on to the more interest builds in the set and we’re beginning with Emmet’s Escape Buggy. The most interesting aspect of this build is that we do have a complex set build comparison, 70829, which features a replica of the vehicle from the movie in all it’s splendor. That set, however, comes in at £45 and with a target age of 8+, it’s not really the set for those LEGO fans just starting out on the standard bricks. This build is somewhat more straight-forward, to say the least. It’s a great mimic in colour-scheme, but that’s about as far as the comparisons can really go with the more expensive set. Where you can expect Technics design for the intricate chassis of that other set, this buggy gets a basic oblong pieces with wheel pins, nothing more and it’s perfect for a quick build that’s going to get the imagination racing for children. 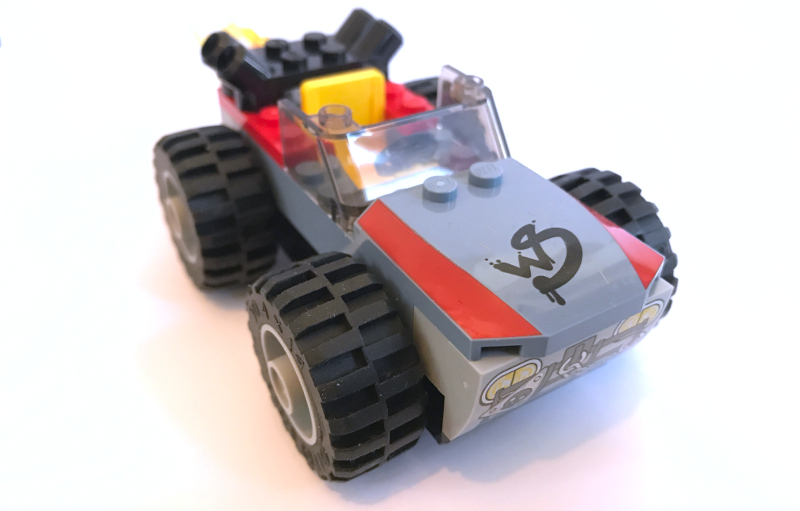 Much like the other builds in the set, the main details for the buggy comes in the form of pre-printed pieces, with both the hood and the front bumper covered, the former showing Wyldstyle’s tag and the latter headlights and a chained grill. While the tag works well, I’m a little disappointed that more effort wasn’t put into the design to add headlights as bricks rather than this large print. It could have been done with relative ease with adding much to the complexity and would have added far more to the finished model than this. 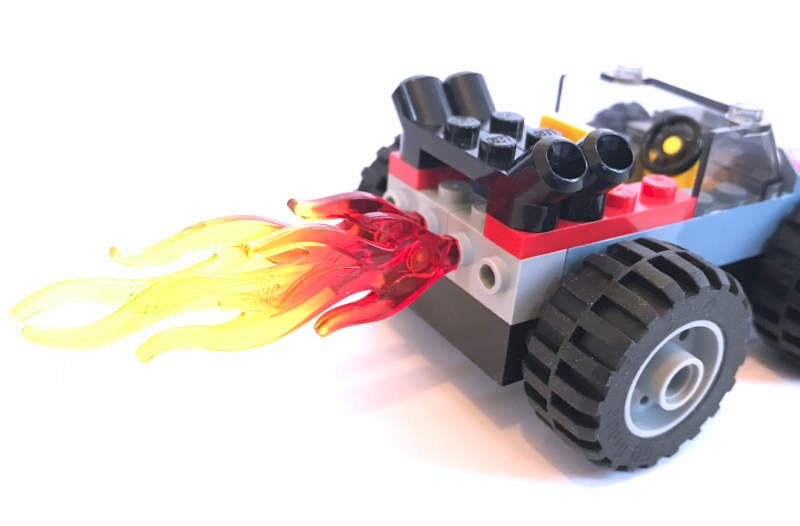 At the other end of the buggy, we get a rudimentary engine, complete with large flames sticking out of the back, an attempt to imitate the larger model, and it works really well within the confines of the sets theme – this isn’t going to be a set that many adult collectors will invest in for the builds, that’s a given. Aside from the windscreen, inside the vehicle you’ll find a basic setup, just a steering wheel and a seat, but as Emmet will easily fit in here the playtime can begin fairly quickly with this one. The build itself is only around 20 pieces and more than meets the expectations of the 4+ goal. As long as you know what this set is going for, it’s very difficult to be disappointed with the model, it’s chunky, easy to build, and looks unique, it’s the perfect vehicle to a 4-5 year old to build themselves. As we move on to the space side of things, this is where my interest perked up. I grew up in the 80’s and 90’s and so my first memories of LEGO are tied to the classic space sets which provided the inspiration for Benny. 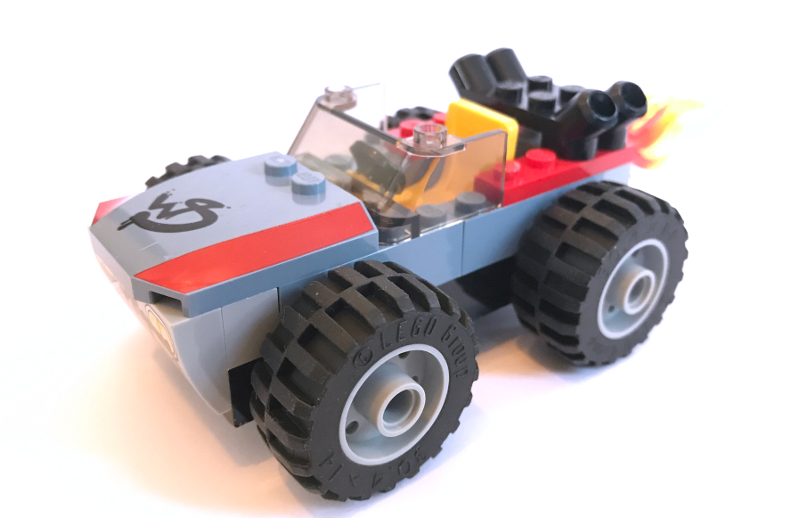 This little buggy, as simplistic as it is, will no doubt target the nostalgia of any 30-something LEGO fan, building these type of vehicles and a ship to put them in, without instructions, was a good portion of my childhood LEGO time. 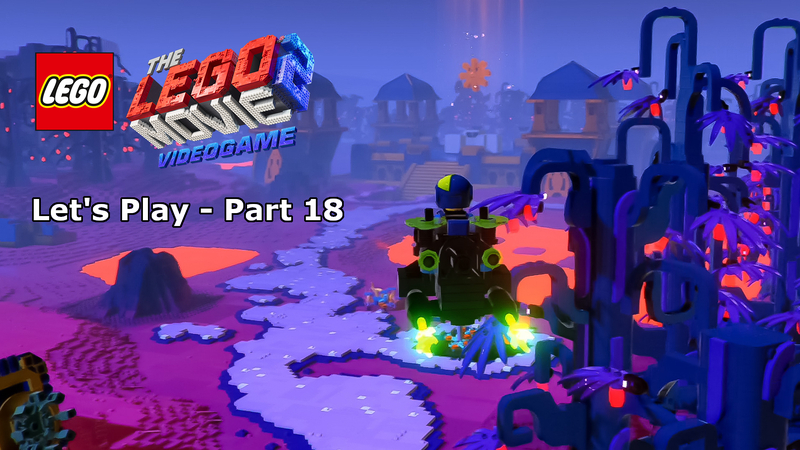 Going back to what I said in my review of the Space Squad set, this is where the LEGO Movie sets are at their best, and why the movie appeals to such a large age group, nostalgia and multi-generational play and this part of this set provides that bridge between parent and child once more. With very little to say about this little buggy, however, let’s move on to the SPACESHIIIPPPP! Well, look at it. If I had to picture a build from 30 years in my past it would look a lot like this – also it’s pretty clear who’s ship this is, the entire colour scheme says, ‘BENNY!’. This is the star of the show in this set and the one thing that may get older fans buying the set, the retro-looking setup will no doubt interest a number of adult fans of LEGO. From the big logo on the front to the perfectly symmetrical design, this is every bit an old-school LEGO build. The base itself is one huge triangular piece moulded specifically for this use, much like some of the spaceships of old when they first started hitting the shelves. It just looks glorious, especially given the luminous yellow windscreen. Where the play value really kicks in is on the back. The two large boosters are actually on stiff hinges which can be opened to reveal a loading bay for the space buggy, OH YES REALLY. Thirty-somethings, this is what you were probably building when you were young, I know I was. With the buggy in the back, you can easily put the boosters back into place. 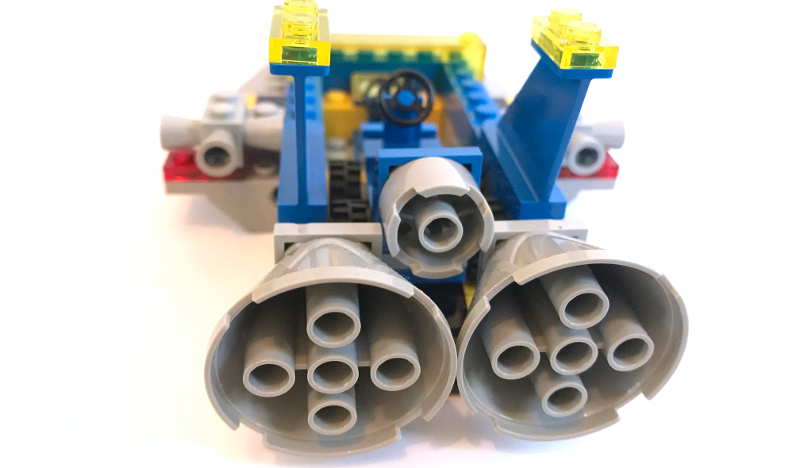 As you can see from the picture, the little booster on the back of the buggy actually integrates into the overall ship design and looks superb, this does also offer a second seat for Lenny, Kenny, or Jenny, should you have the Space Squad on standby. It’s a fantastic design that really pushes the simplistic approach of the junior 4+ set designs to their maximum, providing an easy to build model with few fiddly pieces and unlike Emmet’s buggy, there is no additional detail required with printed pieces, other than the logo on the front that is. Inside, it’s simplistic, though it does have a set of dials at the front, a piece you’ll have seen in hundreds of sets over the years, but what more do you really need? There’s plenty of options for adding to it if you want to, but this ship does more than enough to entice not just it’s target audience, it just looks great. Buying this set, it’s important to understand the target audience. Where many LEGO sets will have a recommended age of around 7-8 years and offer more than enough to appeal to adult fans as well, this is very much the next step in the evolution of the LEGO juniors sets. The 4+ sets are great for helping young fans transition from DUPLO to standard LEGO and with that in mind you need to go into this knowing that these builds are going to be simplistic. 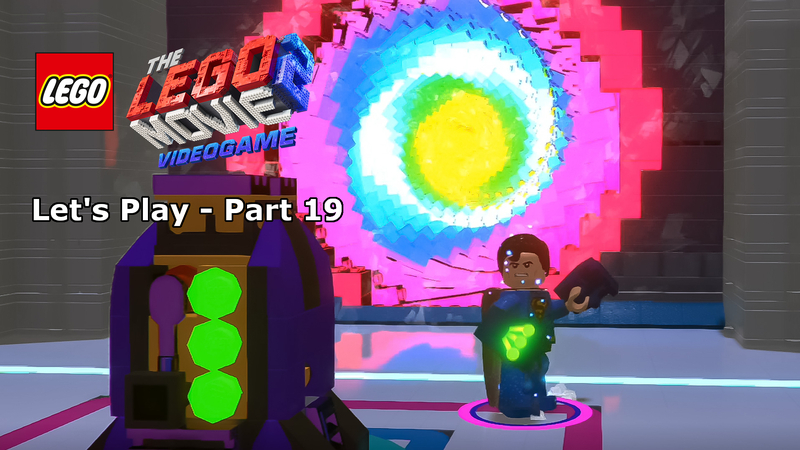 With that in mind, this is a great introduction sets for those LEGO Movie fans who weren’t around when the first film hit cinemas. It brings in two of the most beloved characters from the franchise and give each of them a unique vehicle fit for purpose, as well as some highly reusable scenery builds which only add to the playtime. 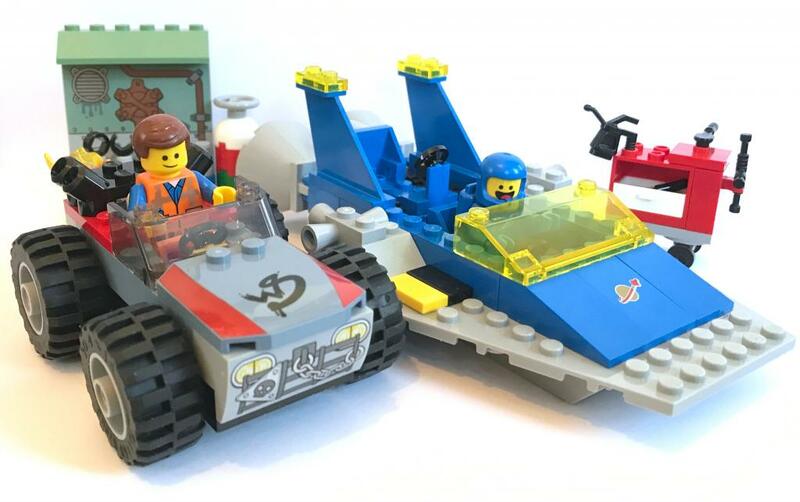 While there will be very little to entice adult LEGO fans to the set, Benny’s spaceship and space buggy will no doubt peak your interest as the nostalgia floods in. 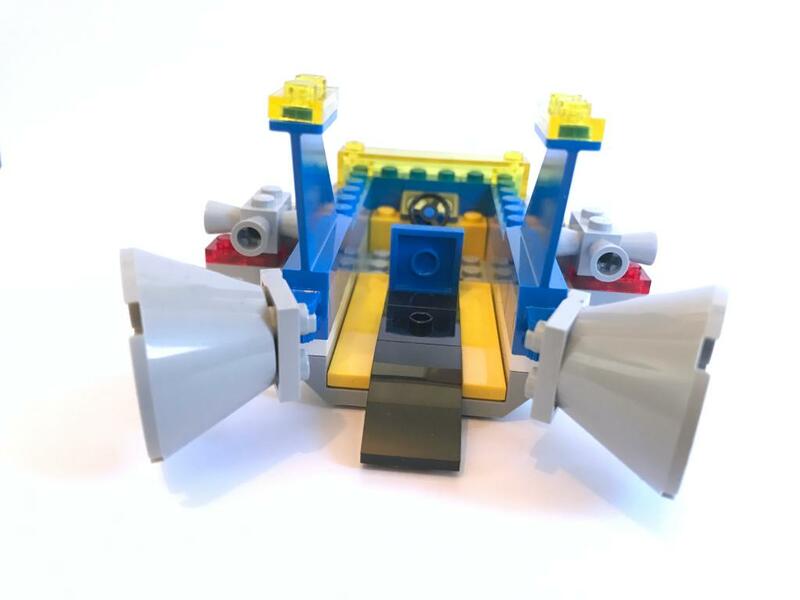 There are a few design choices that I believe are a little lazy, such as Emmet’s buggy’s headlights being printed, overall this set does a great job of giving young LEGO fans the opportunity to build something awesome with very little parental assistance. 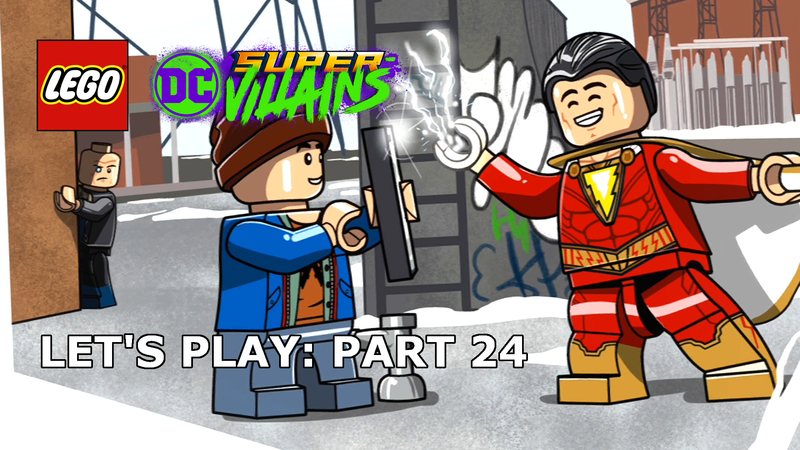 The complexity level of the builds perfectly fits the 4+ (Juniors) theme. 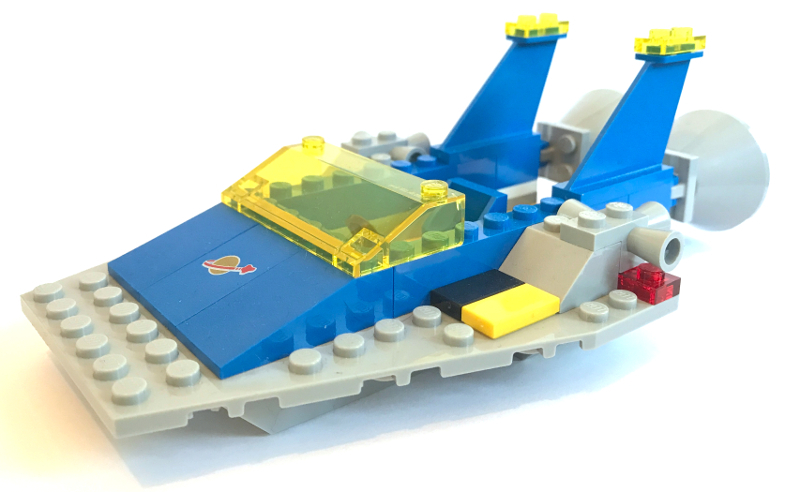 Benny’s Spaceship is superb, even parents will enjoy this one as the nostalgia kicks in. 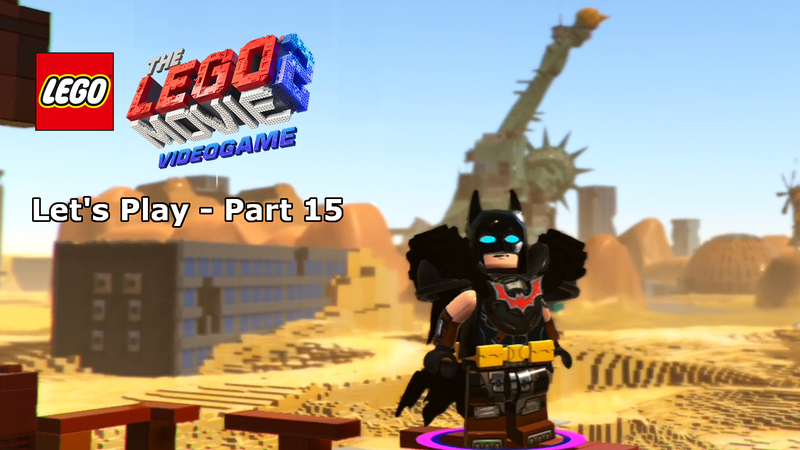 Plenty of little builds, each one different, meaning short attention spans will not get bored. 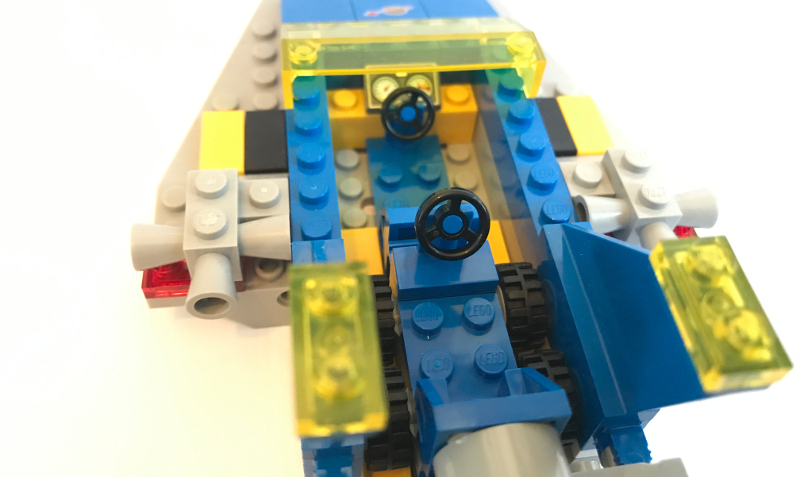 Emmet’s buggy design is a little lazy, they could have added headlights as bricks rather than printed pieces with minimal effort. Very little collector value here. The evolution of LEGO Juniors to the 4+ has seen some great sets which bridge the gap between Duplo and standard LEGO. Whether it’s Marvel, Star Wars, or LEGO Movie 2 sets, they seem to nail the balance of simplicity and awesomeness and this set is just that. A nice mixture of small/medium builds which each have their own unique design means that it’s very difficult for your young LEGO fan to get bored. The spaceship is the star of the show here, that’s for sure, but overall, the whole set will be a winner. Ignore the piece numbers vs. price, it’s still worth the asking price.